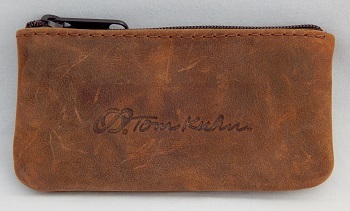 Tom Kuhn real leather carry pouch for your spare parts. Handmade in the USA of genuine cowhide with a YKK center zip pouch. The pouch was great for storing ball bearing axles, axle rods, response discs, pads, strings, coins, earbuds, and small valuables. Measures 127 mm wide x 70 mm tall x 19 mm thick.